There are two strains of RVHD, known as RVHD1 and RVHD2. 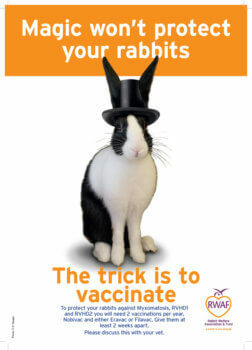 Both strains are lethal and you must vaccinate to protect your rabbits. RVHD2 has been in the UK since 2013 and over time appears to be overtaking classic RVHD as the primary strain. RVHD vaccines are very effective. Your rabbits can currently be protected against RHD1 using the Nobivac Myxomatosis-RHD vaccine with a booster every 12 months. Both strains of RVHD are covered by vaccination any time from ten weeks (Filavac) or RHD2 can be prevented from 30 days (Eravac) of age. The separate RVHD2 vaccine is given every 6-12 months. 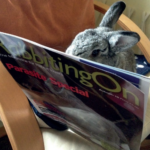 You should consult your vet for the best combination currently available for your rabbit(s). It’s very important to clean and disinfect anything that may be carrying the viruses, including water bottles, bowls, bedding and housing. 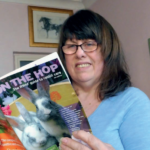 This means that boarding and rescue rabbits, even with up to date vaccinations, may potentially be a risk, and establishments should take suitable precautions, as should vets who may have infected rabbits brought to them for treatment. Anything that has been touched by an unknown rabbit should be thoroughly cleaned and treated with virucidal agents. In high risk situations foot covers or foot dips may be wise measures. Don’t use second-hand hutches or equipment without finding out what happened to the previous occupant. Mortality may vary from collection to collection, and possibly from breed to breed. 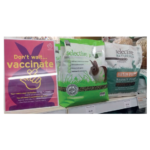 The only vaccine for rabbits initially available with a UK License was Nobivac Myxo-RHD (MSD Animal Health), which was made available in 2012. Not long after that, the other 3 vaccines against RHVD on the UK market ceased to be available. This vaccine does not appear to offer protection against RVHD2, and neither do the previous vaccine brands available in the UK. However, RHD1 and Myxo remained the most significant health threats which could be vaccinated against, and so coverage with this product remains a priority. Work from Italy and France, however, suggests that, with our reservoir of wild rabbits, we can expect to see RHD2 starting to predominate over RHD1 in the next 5 years or so. Previously there were three vaccines (Filavac VHD K C+V, Cunivak RHD and Cunipravac RHD-2 Variant) that initially had a Special Import or Special Treatment Certificate from the Veterinary Medicines Directorate, on the basis of a clear need to do so given the current disease status. That need now having been firmly established, Filavac VHD K C+V, and Eravac VHD are now licensed. Practices should check availability of these products directly with their wholesalers. Owners should check with their practices which vaccines they hold, and what the protocol for vaccinating rabbits is at the practice in question. Stocks are sometimes very variable, and practices are advised to contact wholesalers directly for information on stock availability. I would still be interested in any other practitioners findings regarding reports of suspected or confirmed RHD1 and 2. 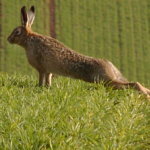 This will obviously involve a risk assessment of the individual rabbit(s), but the wide geographical range of the disease, and the reported losses of several hundred rabbits throughout the UK, as well as molecular testing confirmation of cause of death in many sampled, suggests that vaccination is strongly advisable. Do existing RHD1 vaccines work? Because the mortality rate is lower with RHD2, any test using a small number of rabbits could easily show protection just because none of them were going to die anyway. There is some anecdotal evidence that RHD1 vaccines have some short term effect, but nothing peer reviewed. Le Gall-Recule (2013) showed that cross immunity between RHD1 and 2 was, at best, partial. Please only go through your vets, rather than contacting wholesalers directly. Standard advice with immunological products not licensed for simultaneous administration is to space them out by at least 2 weeks, and this is the regime we advise with both vaccines. The duration of immunity for Filavac has been established at at least 12 months, in laboratory conditions in healthy rabbits. 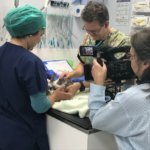 The manufacturer’s advice is to administer a single dose of the vaccine, followed by annual boosters in low risk situations, and 6 monthly in the case of breeding does at high risk. In the UK, I would suggest that high risk situations include rescue centres and breeders, unless they have a strict quarantine policy, and those rabbits which have greater contact with wild rabbits, as well as any geographical location where cases have been reported recently. All other rabbits are likely to fall into the lower risk category, requiring annual re-vaccination. The duration of immunity has not been confirmed in the case of Eravac, but this is expected to be updated shortly. 90% of any disinfection is cleaning, that is the most important aspect. After thorough cleaning of the area to remove any scale or residue, use Ark-Klens , which is a benzalkonium chloride disinfectant and as such it should be effective against EC and myxi, to routinely disinfect the housing. Periodically use Virkon (as an inorganic peroxygen compound) to kill any other viruses. Anigene HLD4V has been confirmed as effective against RVHD2 at a dilution of 1:50. It is important that the correct dilution is used”. Note: Other benzalkonium chloride disinfectants and inorganic peroxygen compounds may be available, in addition to those named above. Vaccinating with an RHD 1 and 2 vaccine (Filavac), 1-2 times per year, on top of an existing RVHD1 and Myxomatosis vaccine (Nobivac), obviously increases the vaccine frequency and amount given to each rabbit. This is not perfect, but the alternative is missing out one of these vaccines, and the risk of “over-vaccination” is considered lower than the risk of insufficient protection. Filavac is an inactivated, adjuvanted vaccine, and so cannot lead to clinical RVHD in the animal. Eravac covers only RHD2, and so there is less concern about “over-vaccination” with this product. Concerns are often raised about vaccine ingredients (adjuvants and excipients) such as aluminium hydroxide and sodium metabisulphite. This is too large a topic to discuss here, but, without dismissing these concerns out of hand, and after weighing the risks against the benefits, vaccination has a strongly net positive benefit against the diseases discussed here. There are known vaccine side effects discussed in the data sheets for these vaccines. They are usually limited to small local transient skin reactions, and transient mild lethargy. Oil based vaccines such as Eravac carry a known risk of skin and subcutaneous tissue damage, and great care must be taken to ensure no vaccine enters the intradermal route, to minimise this risk, as well as taking care not to accidentally self-inject. The frequency of vaccination, and a risk:benefit analysis for each individual, should be discussed between client and veterinary surgeon before deciding on an appropriate regime and vaccination plan. There is a risk to any animal (or person) to having any vaccination, which is why animals (or people) should only be vaccinated if they are healthy. For further general details on companion animals, the BSAVA and WSAVA vaccine guidelines should be consulted. Note that under their definitions, in the UK and mainland Europe, RHD2 would be considered a “core” vaccination. 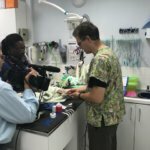 https://www.bsava.com/Resources/Positionstatements/Vaccination.aspx http://www.wsava.org/guidelines/vaccination-guidelines Titre testing against this strain is not commercially available, at least at present in the UK. It’s also worth being aware that other countries are slightly ahead of us in arranging vaccine importation and use for domestic rabbits. In Holland, vaccination has been underway with Filavac for several months before its use in the UK, and they also use the Nobivac Myxo-RHD vaccine. Where can I send samples to get RVHD2 confirmed? The following labs currently offer testing for RHD1 and 2. The OIE (World Organisation for Animal Health) guidelines suggest that liver is the best sample by far, but that spleen and blood are also good tissues to sample, as the virus becomes widespread throughout the body via the blood. The use of swabs to obtain samples from the tissues is possible, but to avoid false results, plain swabs (ie NOT in bacteriology medium such as agar gel or charcoal based material), with metal or plastic handles, not wood, should be used.